For the 2019 film based on the comics, see The New Mutants (film). The New Mutants is a group of fictional teenaged mutant superheroes-in-training appearing in American comic books published by Marvel Comics. They have been the main characters of three successive comic book series, which were spin-offs of the X-Men franchise. Cover of The New Mutants #1 (April 2009). The first team of New Mutants characters was created by Chris Claremont and artist Bob McLeod. They first appeared in The New Mutants (September 1982), part of the line Marvel Graphic Novel, and are subsequently featured in their own title from 1983 until 1991. Like its parent title, The New Mutants highlighted interpersonal and group conflict as well as action and adventure, and featured a large ensemble cast. With the end of the first series, the characters were relaunched as X-Force in a new, eponymous series. The second New Mutants series, launched in 2003, featured a new group of teenage mutants. Unlike the original New Mutants, they were part of a huge cast of students at the Xavier Institute. In 2004, it was relaunched as New X-Men: Academy X, after which the central group was formally dubbed the "New Mutants." 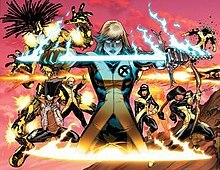 In the aftermath of the "M-Day" crossover storyline in late 2005, the remaining students were merged into one junior team, the New X-Men. The third New Mutants series, reuniting most of the original team, was launched in May 2009. A film featuring the New Mutants was announced in May 2015. By the early 1980s, Uncanny X-Men (under the authorship of Chris Claremont) had become one of the comic book industry's most successful titles, prompting Marvel editor-in-chief Jim Shooter to launch The New Mutants, the first of several X-Men spin-offs. X-Men editor Louise Simonson recalled "Neither Chris [Claremont] or I really wanted to do it. We wanted X-Men to be special and by itself, but Shooter told us that if we didn't come up with a new 'mutant' book, someone else would." The name was a modification of Stan Lee's original name for the X-Men, "The Mutants". The New Mutants were teenaged students of Professor Charles Xavier's School for Gifted Youngsters and wore matching uniforms, much like the original X-Men, who had since grown into adulthood. These students, however, rather resembled the "all-new, all-different X-Men" of their era in terms of ethnic diversity. Cannonball (Samuel Guthrie), a 16-year-old Kentuckian and eventual co-leader, with the ability to generate thermo-chemical energy and propel himself through the air. Karma (Xi'an Coy Manh), a 19-year-old Vietnamese girl and the team's original leader, who could mentally possess other people's bodies. Mirage (Danielle Moonstar, originally codenamed Psyche), a Cheyenne and eventual co-leader after Karma's apparent death, who could create visual empathic three-dimensional illusions. Sunspot (Roberto da Costa), a 14-year-old Brazilian, who had superhuman strength fueled by sunlight and could store solar energy in his body to use his super strength during the night. Wolfsbane (Rahne Sinclair), a 13-year-old religious Scot who could transform into a wolf and a werewolf-like creature. The series was originally written by Claremont and illustrated by McLeod, the team's co-creators, but McLeod soon passed artistic duties on to Sal Buscema. McLeod was unprepared for the demands of doing both pencils and inks on a monthly book, prompting him to have Buscema do the breakdowns after the first three issues, and left entirely after issue #8 when he began to lose interest in the stories. Claremont gave the series a darker tone, which was heightened with the arrival of artist Bill Sienkiewicz. Sienkiewicz's avant garde art style and painted covers broke through the conventional comic book boundaries of the day and helped The New Mutants stand out on the shelf. In addition to very serious depictions of teenage angst and growing pains, the series featured themes of mysticism. The stories also relied on wilder, more far-fetched premises than were typical of X-Men at the time, shaping into more of a science fiction and fantasy series than the superhero coming-of-age comic it had been touted as in its early days. Locales included demonic dimensions, alternate futures, and an ancient Roman civilization hidden within the Amazon rainforest. The New Mutants also encountered a secret society called the Hellfire Club, and began a rivalry with their young apprentices, the Hellions. Cypher (Douglas Ramsey), an otherwise ordinary young man who could learn to read or speak any language rapidly, whether it was human, alien, or machine, making him an unmatched computer expert. Magik (Illyana Rasputin), sister of the Russian X-Man Colossus and long-time resident of the X-Mansion, an accomplished mystic who could open "teleportation discs" allowing travel to Limbo and from there, any point on Earth. Magma (Amara Juliana Olivians Aquilla), a fiercely tempered native of a secret Roman society in the Amazon who can control lava. Warlock, an extraterrestrial of the techno-organic race known as the Technarchy. A supplementary New Mutants Annual series began in 1984. These annuals were always written by whoever was the regular New Mutants writer at the time and often included significant changes to the status quo which were not explained in the parent series, so that readers would have to buy New Mutants Annual in order to follow events in both series. The 1985 annual was solicited as New Mutants Annual #2, but published as New Mutants Special Edition #1 because it exceeded the maximum page count for an annual. In 1986, Professor X was written out of the series. Before he left, he made the X-Men's one-time nemesis, Magneto, headmaster of his school. Magneto would be the team's longest-running headmaster, holding the position from New Mutants #35 through to #75. Fiercely overprotective of his students, particularly after the events of the "Mutant Massacre" and "Fall of the Mutants", he was increasingly used as an uptight foil for the adventurous New Mutants, setting rules that they would inevitably break in the interests of helping their friends. With Claremont taking on Wolverine and Excalibur, he left The New Mutants and the series was turned over to writer Louise Simonson and illustrator Bret Blevins with issue #55 (Sept. 1987). Simonson was intended to be only a fill-in writer for the six months Claremont needed to get the two new series launched, but he ultimately remained with his new projects, and Simonson ended up writing the series for over three years. During her run, Magma is written out of the book, and Magik is de-aged back to childhood. Due to his unpopularity with New Mutants readers and artists, Cypher is killed off in The New Mutants #60 (February 1988). Simonson recalled, "He wasn't fun to draw. He just stood around and hid behind a tree during a fight... Every artist who ever did him said 'Can't we kill this guy?' We would get letters from fans about how much they hated him." Simonson also folded the X-Terminators, a group of young wards from X-Factor, into the New Mutants. Boom-Boom (Tabitha Smith), a teen runaway who could create "plasma bombs." Rusty Collins, a pyrokinetic wanted by the U.S. government. Rictor (Julio Richter), a young Mexican who could create shock waves. Skids (Sally Blevins), a former Morlock who could project a frictionless force field around her body. In 1989, Simonson crafted a saga in which the team journeyed to Asgard, the home of the gods of Norse mythology. The storyline wrote Dani Moonstar out of the series, as she joined the Norse pantheon as one of the Valkyrior. However, the most controversial issue of her run was New Mutants #64. Titled "Instant Replay! ", the story deals with the New Mutants' mourning for Cypher, and includes a scene in which Warlock attempts to resurrect Cypher by taking his corpse out of its coffin and showing it to Cypher's loved ones. Simonson holds it to be her favorite New Mutants story, though she acknowledges that many readers found it too morbid. "Domino" (Vanessa Geraldine Carlysle), Cable's pale-skinned, black-garbed mercenary lover. Actually Copycat, impersonating Domino. Feral (Maria Callasantos), who possessed a bestial temperament and appearance. Shatterstar (Gaveedra Seven), a swashbuckling warrior from another dimension. Warpath (James Proudstar), the younger brother of slain X-Man Thunderbird and a former Hellion, an Apache who possessed super strength and speed. The New Mutants was cancelled in 1991 with issue #100, but the new platoon-like team formed by Cable continued in X-Force, a successful series (whose first issue sold approximately one million copies) that would continue until 2002, and feature a variety of the former New Mutants cast. The New Mutants has been reprinted in several trade paperbacks, some containing specific story arcs (such as the "Demon Bear Saga" by Claremont and Sienkiewicz), and some collected as part of a larger crossover of the various X-titles. Only in 2006, however, did a chronological reprinting of the series begin, with the commencement of The New Mutants Classic series of trade paperbacks. The New Mutants from New X-Men: Academy X #2. Art by Randy Green. From left to right: Danielle Moonstar, Surge, Prodigy, Wind Dancer, Elixir, Wallflower. The second incarnation of the New Mutants debuted in 2003 with an ongoing series of the same name, written by Nunzio DeFilippis and Christina Weir. The series would continue for 13 issues, until June 2004, before being relaunched as New X-Men: Academy X in July 2004, with a new #1. The series featured a handful of the dozens of mutant teenagers attending the Xavier Institute, as well as their instructors, which included various X-Men as well as former members of the original New Mutants (Karma, Magma, Dani Moonstar, and Wolfsbane). Elixir (Josh Foley) – Josh is an Omega-Level mutant who can manipulate his or others' biologies to heal or harm. In addition, Elixir possesses gold skin which converts to black when he uses his powers offensively. He was one of the 27 students at the Xavier Institute to retain his powers after "M-Day". He was seemingly killed by the Dark Riders before returning with vastly enhanced abilities. He is currently taking refuge in Tibet with Xorn. Icarus (Joshua "Jay" Guthrie) – Jay possesses red angelic wings on his back that allow him to fly and which grant him an accelerated healing process. Furthermore, he possesses the ability to manipulate his own voice. He was one of the 27 students at the Xavier Institute to retain his powers after "M-Day". Jay's wings are amputated by Stryker, who later kills him. Prodigy (David Alleyne) – David was the team's co-leader who could temporarily gain the knowledge and skills of those near him. Although he was de-powered after "M-Day", he has retained all the knowledge he had acquired prior to the "Decimation". Current member of the Young Avengers. Surge (Noriko Ashida) – Noriko is Japanese. She absorbs electricity from her environment which she can discharge as powerful electric blasts or utilize as superhuman speed. She requires mechanical gauntlets to prevent overcharge. Surge was one of the 27 students at the Xavier Institute to retain her powers after "M-Day". She is currently a student of the Jean Grey School for Higher Learning. Wallflower (Laurie Collins) – Laurie is a shy girl who generates highly potent pheromones that influence people's emotions. She was one of the 27 students at the Xavier Institute to retain her powers after "M-Day". Laurie was later killed by one of Stryker's men. Wind Dancer (Sofia Mantega) – Sofia was the other co-leader and was a temperamental aerokinetic who was particularly adept at using this power to manipulate sound. She was depowered after "M-Day" and joined a group of fellow ex-mutants as part of the New Warriors. Donning a variety of mechanical gear, she took up the codename Renascence before the group disbanded. Her current whereabouts are unknown. Wither (Kevin Ford) – Kevin could cause organic material to decay with his touch. He eventually switches to the Hellions squad. He is later killed by Elixir. Another such group, advised by Emma Frost, was known as the Hellions and, like their predecessor, was the arch-rival of the New Mutants. Whereas the original New Mutants series revolved around battles with world-threatening menaces, New Mutants volume 2 focused on the characters' personal relationships and struggles with controlling their powers. After "M-Day", the cataclysmic event that decimated the world's mutant population, only 27 of the 182 students enrolled at the Xavier Institute retained their powers. The New Mutants and the other training squads were disbanded, and the remaining students were folded into a single junior team, the New X-Men. Variant cover to New Mutants, vol. 3 #1. Art by Bob McLeod. In May 2009, a third volume of New Mutants was launched. The series was initially written by Zeb Wells and pencilled by Diogenes Neves with the titular characters forming a new field team for the X-Men. The team is a reunion of the cast from the first volume, consisting of Cannonball, Karma, Magik, Magma, Dani Moonstar and Sunspot. The reunion is spun from events from the limited series X-Infernus. Magik shows up at the X-Men headquarters in San Francisco, claiming to be from the future and warning that Dani Moonstar and Karma are in danger. Once tests show that Illyanna is not an imposter, Cannonball leads a rescue mission with her. They are joined by Magma and Sunspot. They end up taking on Legion. In later issue, Warlock returns to Earth and Cypher reappears alive, under the control of Selene. After Warlock frees him from Selene's control, Cypher joins the team. During "Siege", Hela empowers Dani (now going by the codename Mirage) as a Valkyrie to bring the souls of the fallen Asgardians to her. During "X-Men: Second Coming", Karma loses her leg after being repeatedly stabbed by Cameron Hodge. It is replaced with a bionic one. Magik leads the team to Limbo, as part of her plan for revenge against the Elder Gods. Cyclops has her imprisoned for her actions. In the same issue, Cannonball and Karma also leave the team. After they successfully rescue him from Sugar Man, Nate Grey joins the team. When the X-Men split in X-Men: Schism, the team sides with Cyclops and stays on Utopia. Their next mission is to find Blink. After locating her and helping her defeat a mutant rock band (Diskhord), Blink returns with them but decides to join the X-Men at the Jean Grey School of Higher Learning. She does join them during the last issues of the series. The graphic novel Rahne of Terra, by Peter David, is set in a heroic fantasy universe in which Wolfsbane's counterpart is Princess Rain of Geshem. Other denizens of Terra include Rain's lady-in-waiting Tabby (Boom-Boom), the knights Richard (Rictor), Robert (Sunspot), and Samuel (Cannonball) and the peasant boy Douglas (Cypher). The Terrans all duplicate the powers of their counterparts in one way or another. In 1997, a three-issue reunion series written by Ben Raab and illustrated by Bernard Chang, New Mutants: Truth or Death, featured the young New Mutants traveling forward in time to meet their older, jaded selves in X-Force. Here the New Mutants consist of X-Ceptional, who can explode permanently, Riches, who turns whatever he touches to gold, Minerva, who can manipulate reality, and Riches' sister Rags. Riches kills Professor X and takes over the world. Rags begins a relationship with Gambit, and Minerva goes to pure idea. X-Ceptional grabs Riches and explodes, killing them both. In Ultimate X-Men, the Academy of Tomorrow (previously called New Mutants) is founded by Emma Frost. It is loosely linked to the X-Men via Emma Frost's professional relationship with her former lover and teacher Charles Xavier. This Academy accepts any talented students, regardless of their genetic status. The team is headed by a non-telepathic and more pacifistic version of Emma Frost and headed by field leader Havok. During Ultimatum, the Academy of Tomorrow is destroyed in a terrorist attack by Multiple Man. Former members include Angel, Beast, Cannonball, Cypher, Dazzler, Karma, Northstar, Polaris, and Sunspot. The live-action film X-Men: Days of Future Past (2014) featured several of the New Mutants characters in supporting roles, namely Clarice Ferguson / Blink, James Proudstar / Warpath, and Robert da Costa / Sunspot portrayed by Fan Bingbing, Booboo Stewart and Adan Canto, respectively. In May 2015, 20th Century Fox announced Josh Boone will direct a film adaptation of the New Mutants. Lauren Shuler Donner and Simon Kinberg will be producing the film, while Boone and Knate Gwaltney are writing the script. Boone and Gwaltney initially pitched the film to Kinberg and Fox by making a comic book mapping out a trilogy of New Mutant movies using panels from the original issues. In October 2015, Boone tweeted that the first draft for the script is complete. Kinberg has stated that the film will be a young-adult style movie. On March 31, 2016, HitFix reports that Maisie Williams and Anya Taylor-Joy were rumored to be cast as Wolfsbane and Magik. Boone announced on his Instagram account that the second draft for the film is finished. Boone posted a photo on his Instagram page showing that those appearing will include Magik, Wolfsbane, Mirage, Cannonball, Sunspot, and Warlock. Kinberg told Collider in an interview that Professor X will appear and filming may start in early 2017 and told That Hashtag Show that the film is very loyal to the comics. On August 25, 2016, The Hollywood Reporter reported that Boone will re-team with his The Fault In Our Stars writers Scott Neustadter & Michael H. Weber to write the script. On November 9, 2016, Kinberg announced to The Hollywood Reporter that filming would start in spring 2017. At almost the end of the month, Coming Soon.net reports that Demon Bear would be the main antagonist in the film, the site also reveal that 20th Century Fox is currently targeting a Spring 2018 release date, the film's tone is describing as a "Stephen King meets John Hughes-style horror movie" and that Nat Wolff is being eyed for the role of Cannonball. In December 2016, it was announced that the film would begin production in May 2017. That same month, Boone told Creative Screenwriting that the film inspired his script from Chris Claremont's run with Demon Bear. In January 2017, Taylor-Joy confirmed in an interview with Superhero Hype that James McAvoy will be reprising his role as Charles Xavier / Professor X in the film. In May 2017, Anya Taylor-Joy and Maisie Williams were officially cast to play Magik and Wolfsbane respectively. Later that month, Charlie Heaton and Henry Zaga were cast to play Cannonball and Sunspot. On June 2, 2017, Blu Hunt was cast as Mirage. The film is scheduled for release on June 7, 2019. The animated TV series X-Men: Evolution (2000–2003) featured a group called the New Mutants who, like their comic book counterparts, were a junior team living at the Xavier Institute concurrently with the X-Men. The team featured Boom-Boom, Cannonball, Magma, Sunspot and Wolfsbane. Other members, such as Berzerker, Iceman, Jubilee, and Multiple Man were not New Mutants in the comic book series, but were featured in other X-Men comics. Mirage also appeared in the show's penultimate episode where she joined the team in a dream she projected into Shadowcat's head. New Mutants is the name given to the "race" of Mutants on the television show Mutant X. ^ a b Fleming, Jr, Mike (May 13, 2015). "Fox Mints 'The New Mutants' X-Men Spinoff; 'The Fault In Our Stars' Helmer Josh Boone To Direct". Deadline. ^ a b c d e f g Grant, Paul J. (August 1993). "Poor Dead Doug, and Other Mutant Memories". Wizard: X-Men Turn Thirty. pp. 66–69. ^ a b c d e Buchanan, Bruce (August 2008). "The New Mutants: From Superhero Spin-Off to Sci-Fi/Fantasy". Back Issue!. Raleigh, North Carolina: TwoMorrows Publishing (29): 62–68. ^ "Report Card" letters page, The New Mutants #30 (August 1985). ^ The New Mutants #57 (November 1987). Marvel Comics. ^ The New Mutants #73 (March 1989). Marvel Comics. ^ "X-Men: Days of Future Past Comic-Con 2013 – Full Panel". July 21, 2013. Retrieved September 1, 2013. ^ "Empire X-Men: Days Of Future Past Exclusive – Blink Cover". Retrieved January 30, 2014. ^ "Empire X-Men: Days Of Future Past Exclusive – Warpath Cover". Retrieved January 30, 2014. ^ Canto, Adan (June 24, 2013). "Twitter / adancanto: "@ghosthunter: @X4X5Campaign I'm excited for @adancanto as Sunspot!!" Thanks! Next summer". Retrieved July 21, 2013. ^ "Empire X-Men: Days Of Future Past Exclusive – Sunspot Cover". Retrieved January 30, 2014. ^ "From All We Had to X-Men: Josh Boone, a Busy Man". Creative Screenwriting. Retrieved December 15, 2016. ^ "Instagram photo by Josh Boone • Aug 13, 2015 at 5:16pm UTC". instagram.com. ^ "Josh Boone on Twitter". twitter.com. ^ Lovett, Jamie (January 6, 2016). "New Mutants Will Be A Young Adult Movie". Comic Book. ^ McWeeny, Drew (March 31, 2016). "EXCLUSIVE: Are These Josh Boone's First Three 'New Mutants'?". HitFix. ^ "Instagram photo by Josh Boone • Apr 15, 2016 at 2:03pm UTC". instagram.com. ^ "Instagram photo by Josh Boone • May 2, 2016 at 12:01am UTC". instagram.com. ^ "Instagram photo by Josh Boone • May 3, 2016 at 5:40pm UTC". instagram.com. ^ "Instagram photo by Josh Boone • May 3, 2016 at 7:15pm UTC". instagram.com. ^ "Instagram photo by Josh Boone • May 4, 2016 at 2:48am UTC". instagram.com. ^ "Instagram photo by Josh Boone • May 4, 2016 at 2:50am UTC". instagram.com. ^ "Instagram photo by Josh Boone • May 4, 2016 at 2:55am UTC". instagram.com. ^ "Instagram photo by Josh Boone • May 4, 2016 at 2:51am UTC". instagram.com. ^ Chitwood, Adam (May 10, 2016). "'New Mutants': Simon Kinberg Says Professor X Will Appear; Filming Could Begin Early 2017". Collider. Retrieved 10 May 2016. ^ That Hashtag Show (7 July 2016). "EXCLUSIVE: Simon Kinberg and Olivia Munn Talk X-Men, New Mutants, and Gambit - Saturn Awards 2016" – via YouTube. ^ Kit, Borys (August 25, 2016). "'Fault in Our Stars' Writers Tackling 'X-Men' Spinoff 'New Mutants' (Exclusive)". The Hollywood Reporter. ^ Kit, Borys (November 9, 2016). "-Fox's X-Men Issues: Jennifer Lawrence Unsigned, 'Deadpool' Defections, 'Gambit' on Hold". The Hollywood Reporter. ^ Perry, Spencer (November 23, 2016). "EXCLUSIVE: An Animatic from the New Mutants Movie Lands Online!". ComingSoon.net. ^ "When X-Men's New Mutants Is Finally Filming". 9 December 2016. ^ McKittrick, Christopher (December 15, 2016). "From All We Had to X-Men: Josh Boone, a Busy Man". Creative Screenwriting. ^ Evry, Max (January 5, 2017). "New Mutants Movie Exclusive: Anya Taylor-Joy Says James McAvoy Will Star". Superhero Hype. ^ Goldberg, Matt (May 31, 2017). "'New Mutants' Finds Its Cannonball with 'Stranger Things' Star Charlie Heaton". Collider. Retrieved May 31, 2017. ^ Sneider, Jeff (May 31, 2017). ""STRANGER THINGS" STAR CHARLIE HEATON TO PLAY CANNONBALL IN "NEW MUTANTS"". The Tracking Board. Retrieved May 31, 2017. ^ Perry, Spencer (April 22, 2017). "New Mutants, Deadpool 2, and Dark Phoenix Release Dates Revealed". Comingsoon.net. New Mutants at Don Markstein's Toonopedia. Archived from the original on March 28, 2016.